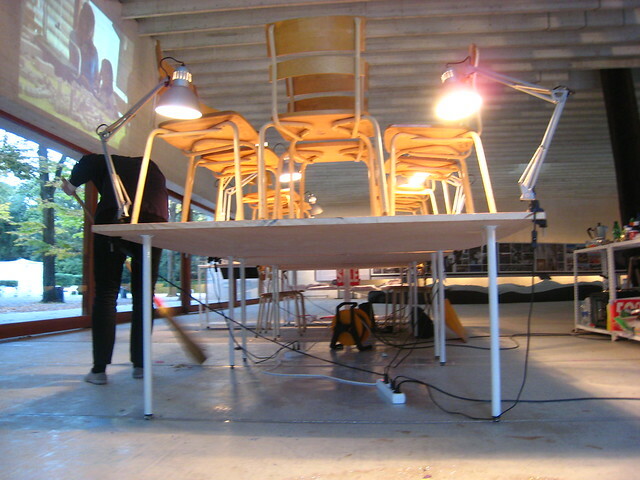 A hectic saturday at the Nordic pavilion comes to an end. See you tomorrow! Sorry Anders, Erik and Tor (Testbedstudio/ Economy)! Our cover art competition almost depleted the paint, pen, paper and glitter depot, made the printer run out of ink, and got all of the tables smeared in pink stains and glue. The Conditions crew was on their feet for the duration of the day, juggling architectural discourse and kindergarden skills at the same time. We had no idea people were so competitive! Ms Bandolin was unfortunately not able to make it to the House of Ambitions for the ceremony, but has put forward the following statement: "The public opinion is very important for me as it is for every artist working in the public realm. 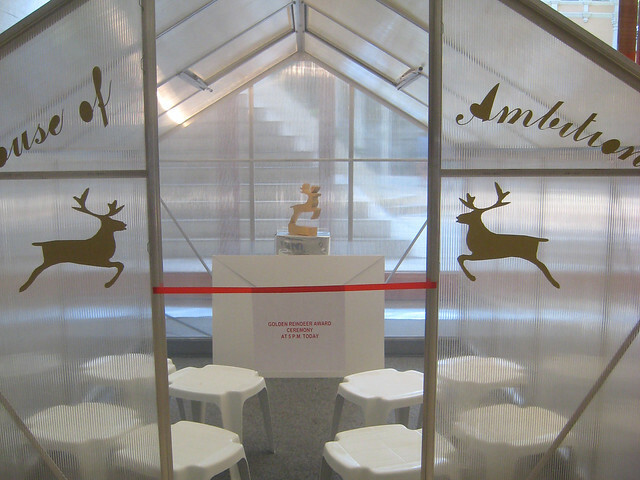 I am an artist (not an architect, as I am presented in the exhibition) and a professor and teach at the Master's programme Art in the Public Realm at the University College of Arts, Crafts and Design in Stockholm. The way I get to know the public opinion is both through comments, but as often in the way they use my sculptures in the public. I have been working with public places for a long time. Over the years my places have been used in many ways, which has given my inspiration to construct new places. My sculptures have been used for such diverse events as weddings, children's babtizements, art-installations, as well as sets for TV and film production, and cd covers (McCoy Tyner used my sculpture Socrates Well in New York on his cd cover, which I found out by finding the cd in a shop in Stockholm). They are often used for leisure means, as sun bathing, picnics, gymnastics, biking, playing etc. This is the way the public tell me what they think of my work. Somtimes they are tagged by graffiti artists too, but not very often. 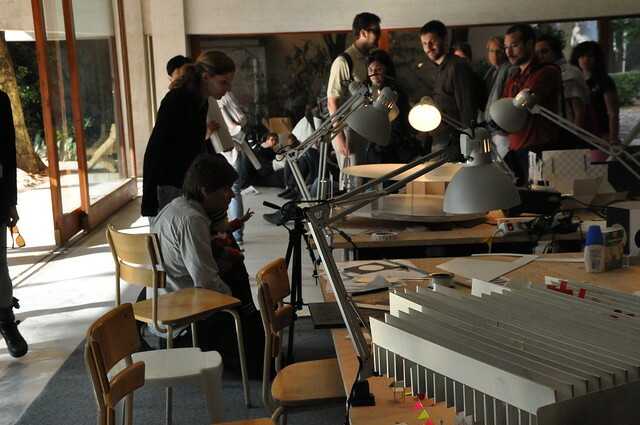 "Conditions: "In general, what is your opinion about architectural prizes? 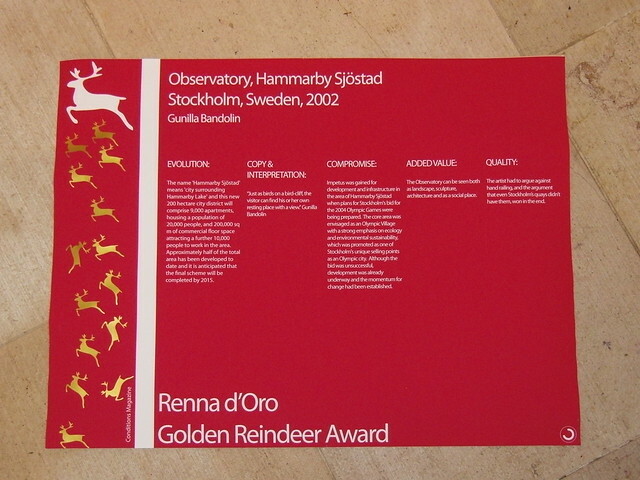 "Gunilla Bandolin: "Architectural prizes are ok."
The winner of Conditions magazine's Renna d'Oro - Golden Reindeer Award at the 2010 Venice biennale of architecture is the Swedish artist Gunilla Bandolin's Observatory at Hammarby Sjöstad, Stockholm Sweden, with an impressive 19,8% of the votes. Observatory was in the lead from the very beginning of the week. 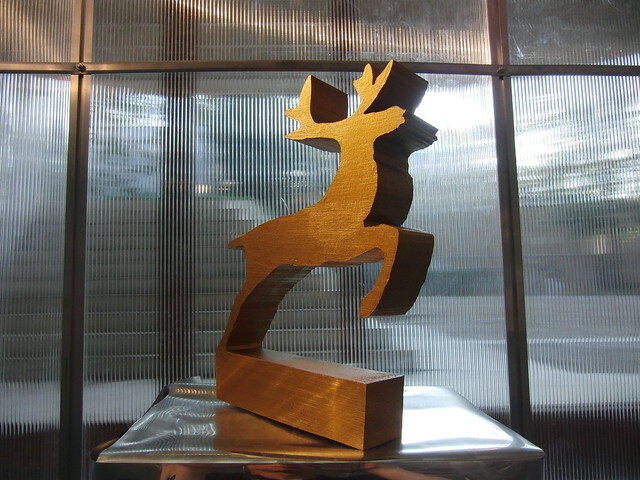 The voting for the Renna d'Oro - Golden Reindeer Award is now closed. 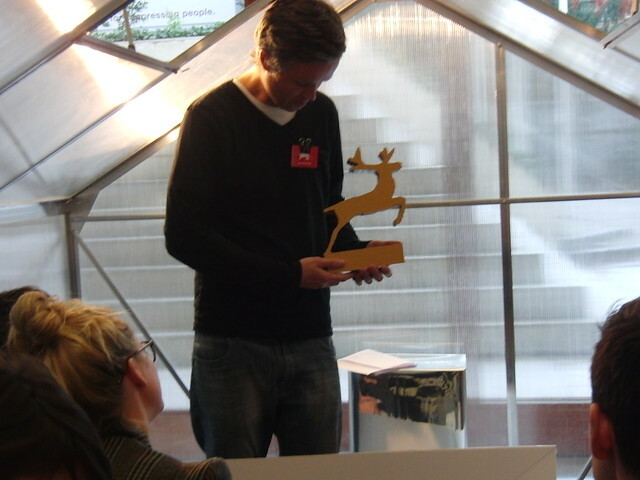 The winner will be announced at the prize ceremony in the House of Ambitions at 17.00. See you there! 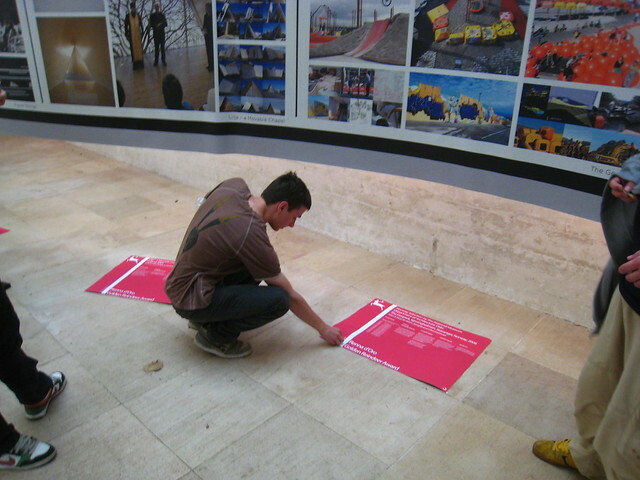 The cover art competition continues to attract the attention of the biennale visitors. The competition is also open to online contributions, but hurry up! We need your proposal before sunday at 17.00. 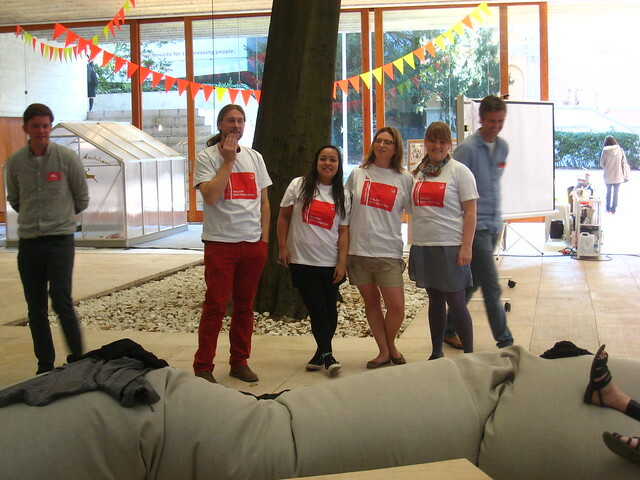 To great applause, group three receive the prize t-shirts for the winning project. 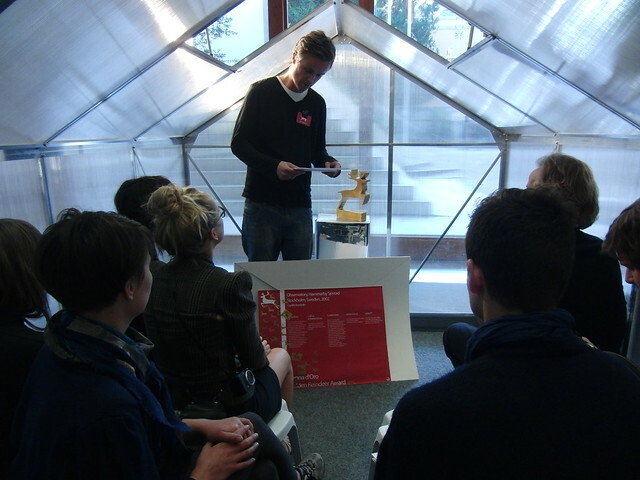 After an intensive work-session by the participants, it was time for the project presentation. Two of the projects were adressing alternative uses of the Giardini area and the national pavilions when the venue is not in use by the biennale. 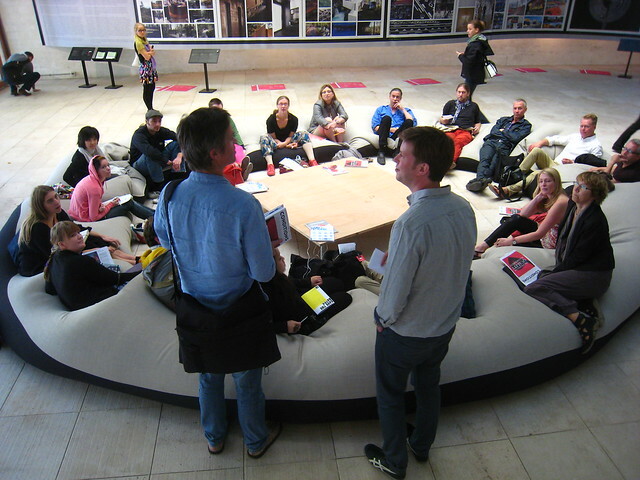 Both groups wanted to make the biennale area more accessible to the city. 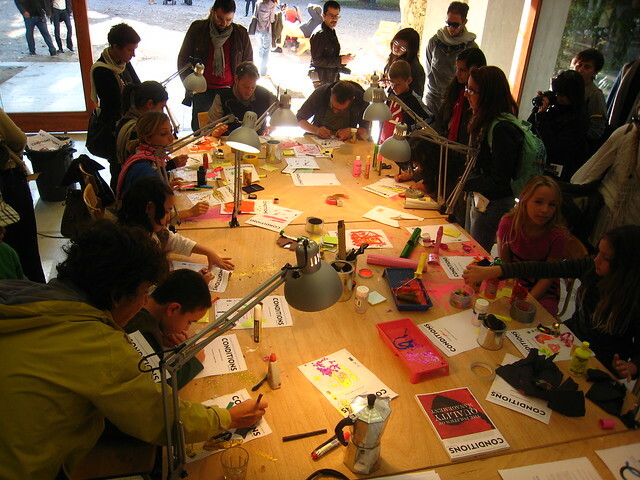 The first project proposed urban farming and other alternative uses, while the second project worked on the possibility of turning the Giardini into an international knowledge park. The third project was dealing with interstitial spaces and borders between private space and public space within the Giardini at a smaller scale. It was great to see so much interesting work done in a short time. The day started off by Tor Inge Hjemdal and Anders Melsom introducing the topic "quality", the theme of the latest issue of Conditions magazine. 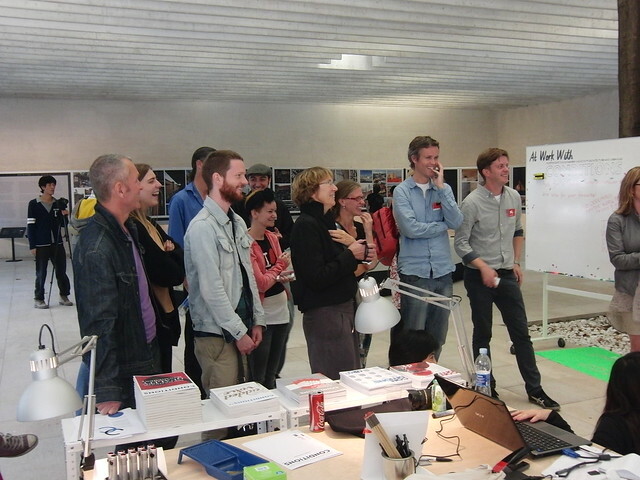 The introduction was the starting point of a one day workshop for a group of visiting master students from Steneby, school of craft and design. 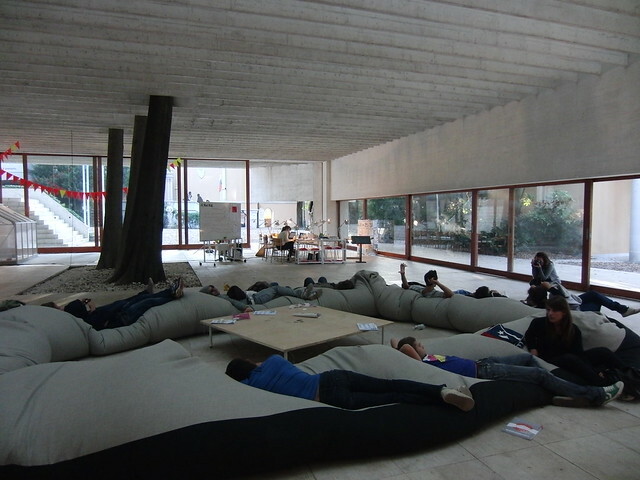 Italian high school kids taking a nap in the donut bean bag after an intense afternoon of cover art design. Gislunn working at the At Work With-station in the background. That's all for today. The prestigious award statue is now in place at our House of Ambitions, awaiting the prize ceremony on friday. The anticipation is rising. 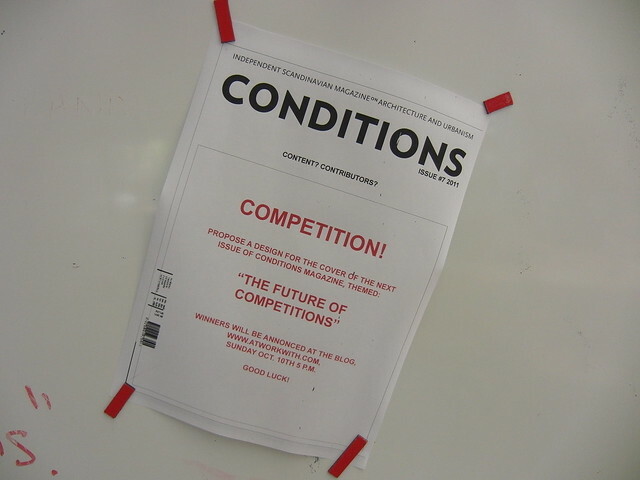 The coming issue of Conditions magazine will be on the theme "the future of competitions". One part of the issue will be dedicated to the proposals in the architectural competition Conditions magazine has launched: "Tell them what they need". It is a competition on competitions, and we invite you to join us by contributing the questions not yet asked. 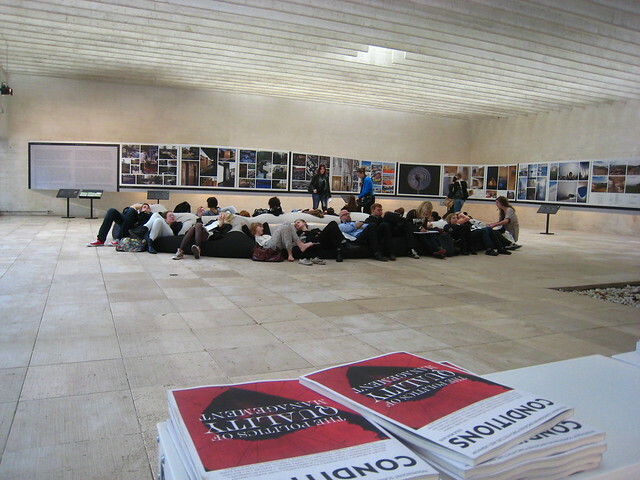 As a mini-version of the competition, a competition for the cover art of the coming issue was just launched in the Nordic pavilion. The design task is to make a cover art proposal for this issue. Winners will be annonced here at the At Work With blog, sunday the 10th of October, 17.00. For online participants, please download the cover template. Good luck! The observatory is apparently the people's project of choice so far. As the first day comes to an end, we conclude by looking forward to the coming days. See you tomorrow! By moving the donut, from experience the most visited part of the pavilion, into the centre of the space we created lots more interaction between the visitors and the exibited projects. First thing tuesday morning: organizing the pavillion, planning the week's programme, and making the damned printer work. 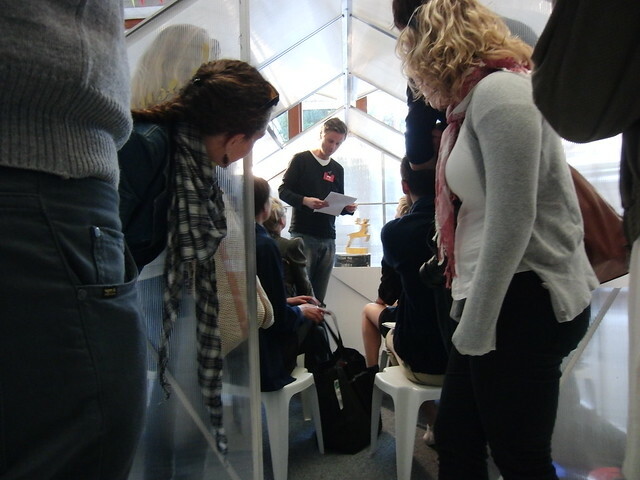 The "Donut" was moved into the centre of the pavilion, to make future intercation between visitors and the exhibition easier. The workstation (plus magazine and t-shirt dispaly) was moved into a favourable corner position, and the small greenhouse turned into the "House of Ambitions", by a few adjustmenst and additions, and set up in the far end of the pavilion. 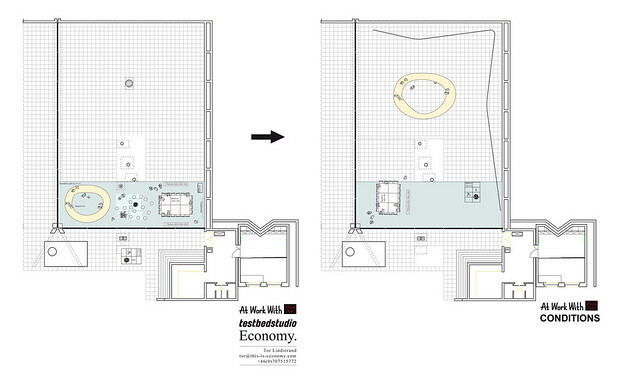 More on the plans för the "House of Ambitions" later on. Joana da Rocha sa Lima, Björn Ehrlemark and Gislunn Halfdanardottir of Conditions magazine is since monday morning present at the residency workstation. Tor Inge Hjemdal and Anders Melsom will join us later on. 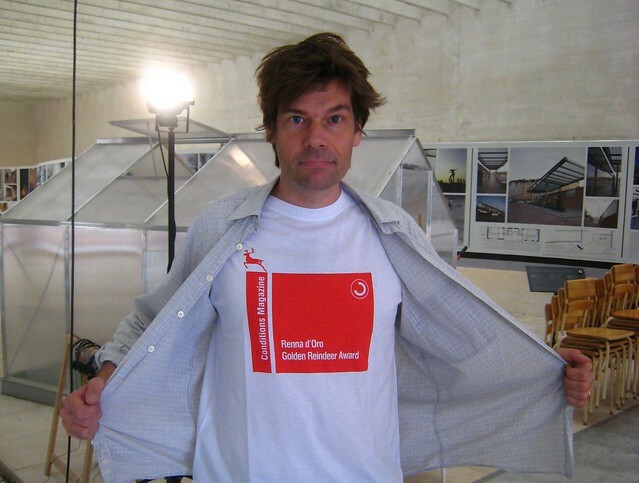 For the switch we met with one of the At Work With initiators, Tor Lindstrand of Economy, who got one of our t-shirts as a thank you for the invitation. 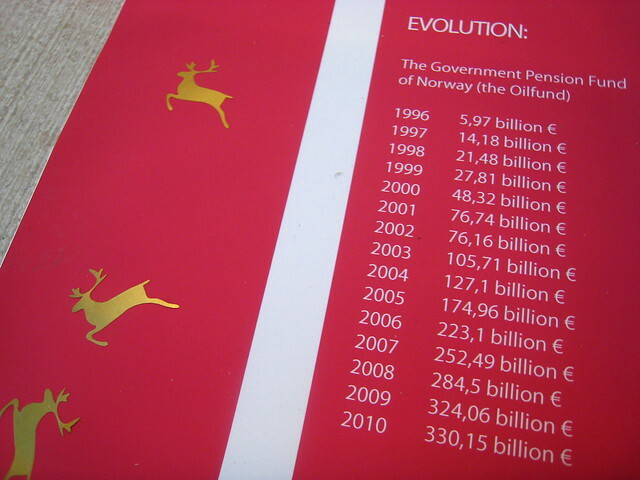 On the shirt you can see the beautiful "Renna d'Oro - Golden Reindeer Award" logo, our main event during the week. More on this later on, but keep the time 17.00 on Friday in mind for later reference. And how did the film turn out? Like this! This is an on-going film project by Economy, mixing architectural model work, imaginary landscapes and associative film-production. A project were the set moves and the camera is fixed. Final Day in the pavilion. Finishing some sets, filming, doing an interview for RUM and talking to people. Hoping that the lovely people from Conditions will have an as wonderful week as we have enjoyed. Spending the last night cleaning out, screening our work from the week and having drinks with people from the Finnish, Australian and British pavilions. Good times.